Shawn Barr: Some Christian families – who used to try and keep church and spiritual endeavors a priority – sports has often become the number one priority. A new spring kid’s sports season is almost here. Soon the local sports fields will be filled with beehives of red-cheeked kids chasing soccer balls. Players will be rounding bases. The sound of aluminum bats will be pinging the air. And there will be the welcome smell of fresh cut, dewy grass on Saturday mornings at sporting complexes across America. And I, for one, love it. Well, most of the time. Over the last 30 years, kid’s sports have changed from having 12 games in the summer for little league (who thought of soccer back then? ); to having kids play 50 to 70 and up to 90 games a season. They have also changed from filling two or three slots in a weekly calendar for sports families – to filling some portion of every day; either for practice, or lifting weights, or games, or special skills coaching, or travel, or early morning runs, etc. These are for non-varsity sports; we’re talking 7 to 13 year olds and sometimes younger. Okay – I sense the hair rising on a few necks – just settle down and hear me out. Firstly, I love sports. All of our four children played baseball, basketball, volleyball, cross country and soccer at some level or another. I lettered in three varsity sports (through some miracle since I am not a natural athlete). I also remember those days after school shooting hoops on a driveway sprinkled with gravel, dreaming I was taking a last second shot for the Hawkeyes (this was before I enrolled at Iowa State). So yes, I love sports; but something has changed. About 2/3rds of the way through the season, the coach wanted the team to play in a “wood bat” tournament on the weekend (once again). I told him, we could, but that it would endanger our son playing in some regular league games later since it would put us over the 50 games. Of course, he was righteously shocked. How could we do this?! How could we let the team down?! He must have thought we were joking about the 50 game limit. (I personally would have rather it been a 25 game limit which really would have shocked him.) And then there was always the pressure to play on a Sunday morning (non-league games) and practice late on Wednesday conflicting with church activities. At what point do kid’s sports cease to be about the kid (character building, exercise, and becoming a team player) and begin to be about the parent wanting to be entertained by little Susie sliding into second? I see you reading this with your mouth open and aghast. You’re thinking, “did he really just accuse me of my kid’s sports being more about me than my child”? Yes and no. I understand that being on a team is a commitment. There needs to be a certain amount of practice time to prepare for games and to develop skills as well as team comradery. Games are also a part of each sport, necessary for development, and well, just plain fun! I like them! But 70 games or more for a 11-year old? Really? Are that many games really necessary for Susie to learn soccer or softball? Or is this about mom and dad wanting some entertainment? And/or pushing their kids with unreasonable expectations. For the Christian family, I have one of those agonizing questions; one that we had to deal with frequently. At what point do you sacrifice family worship and spiritual development at the altar of kid’s sports? As a pastor, I realize I’m biased here. There is nothing more important on my calendar than Sunday worship and Wednesday night church activities. I also understand that following Jesus isn’t just about Sunday mornings or Wednesday nights. However, it is part of it. And, as I read the New Testament, the regular gatherings and activities of the local church seem pretty important. Before you sign your kid up for a league that will keep you away from church activities for three months ask yourself, “what is this teaching my child about the importance of worshipping God and the priority of our church family”? Hey, we all miss a worship gathering here and there. Occasionally there is necessary overtime at work or other activities that interfere with church activities. I get that. I remember the days when schools and sports teams avoided Wednesday nights and Sundays out of respect for those involved in church activities. Those days are gone. Every day and every hour is now game for some type of practice or game (no pun intended). I wonder what would happen, if every Christian family would just say, “we can’t practice or play on Wednesday nights or Sunday mornings”? Question – At what point of over-involvement do we being to see diminishing or even negative returns of our kid’s involvement in sports? Or in other words, how much is too much? I had a friend whose son was a great basketball player. He was a junior in high school and had been playing since early elementary. He was in his prime as a player and ready for his varsity career. At the beginning of the varsity season, he just said, “I’m done.” No amount of pleading, cajoling, bribing, or guilting could convince him to keep playing basketball. His father was devastated. The long off seasons, travel, constant practice, and pressure had gotten to him and he just refused to play anymore. Athletics should be a part of a child’s development. It should be a positive activity in the life of a player and a family. But too much begins to be a burden and pressure. As I mentioned, I loved to watch my kids play sports. And it was disappointing when they moved onto something else or graduated. However, my kids playing sports was about them and not about me. It was for their development and enjoyment. I see many parents who are way more pumped about their kids’ upcoming season than the kid is. It’s important to not project our own desires or interests on our kids. Question – At what point are we feeding the commercialization of kid’s sports instead of thinking about how sports can help our child? I think there’s a big discussion to be had here. Not only for younger kids sports; but for college sports. The enormity of the industry surrounding amateur athletics is jaw-dropping. What used to be about extra-curricular activity and school rivalry has become a corporate, institutional feeding frenzy. More games means more equipment, tournament fees, coaching clinics, etc. Question – At what level does our child’s involvement in sports tilt the scales and make our family completely out of balance? I know families who for the years their kids are playing sports live at the practice field, gym, and ball diamond. And I mean live there. Most waking moments not consumed with work or school are devoted to the sport preference of the child (or family). I can’t tell you how many times I’ve called about volunteer needs for the church (or other civic organizations) and got the response, well Johnny has practice; or he needs to lift weights; or on and on. At what point did it become a badge of good parenthood to be at every single one of your kid’s activities? When did our society change to where it was necessary to drive a kid 25 miles to a practice for that “elite” team? I remember riding my 10-speed to baseball practice. My parents NEVER attended practice – Ever. If it was too far to walk or ride my bike, we would car pool and normally the parents would all go run errands. My parents made the games if they could; but with four kids there were many other things to do. Missing a game was not a big deal to me or my parents. My self-esteem was just fine and I haven’t required therapy because mom or dad missed one of my games. I’m amazed at the parents who watch every practice. And to miss a game would seem to be a federal offense of the most grievous nature. College is unbelievably expensive. We all know this and want to take advantage of every opportunity to reduce college cost and enhance our child’s college experience (with sports). There’s nothing wrong with that! But let’s keep things in perspective. The NCAA estimates that between 3% and 6% of high-school athletes go on to play at the college level (of all divisions – not just D-1). The percentages are much, much lower for those that play at the division one level. Yes, some kids are going to play big-time athletics. But for most, it’s about fun, competition, and character development. I had one long-time high-school coach tell me that if a kid had what it took to play at the college level, he or she was going to make it with the normal high-school sports schedule. There are very few “Rudys” out there. Natural athletes will make the college ranks because of their natural ability. And those who don’t have it, probably won’t regardless of how many games they play. What am I saying here? Don’t make your kid something they are not. I’ve seen so many kids burned out on sports because of hard-driving parents. 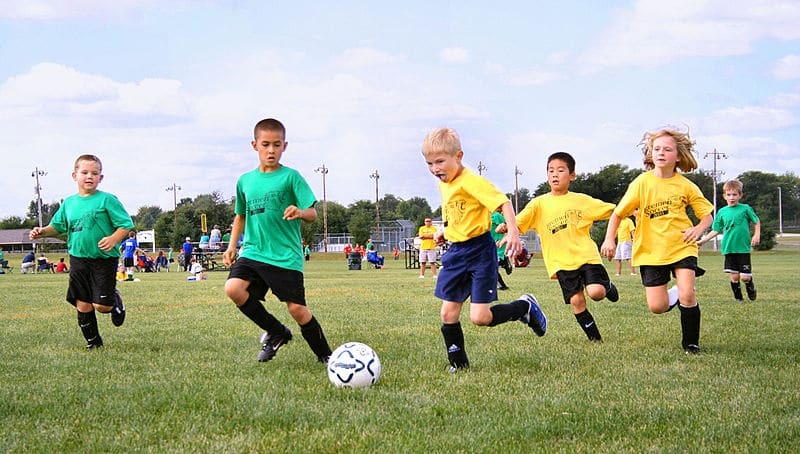 Let you kids enjoy their sport and a reasonable level of involvement. And lest you think an intense practice schedule and many, many games will get Billy in the NBA. The NCAA estimates that only 3 in 10,000 high-school, senior boys playing interscholastic basketball will get drafted. Now that I have a few soccer moms and baseball dad calling hit-men, let me back off a little. As I said earlier, I love sports. I loved watching my kids play sports. I can’t wait to watch my grandkids play sports. I believe involvement in athletics or some type of team activity is critical to a child’s development. We all know it teaches teamwork, endurance, sportsmanship, self-respect and respect for others, and so much more. I think every kid should have some exposure to athletics. One of our family goals is that each child would always be involved in some type of team activity; we felt that strongly about it. And I think your kid should be involved in sports. What schedule will be the best for our child, our family, and our other activities? Does my child enjoy this sport? How can we honor God with our family sport’s schedule? And maybe most importantly, how can we keep it fun! Canadian Journalist, Brian Lilley, says the mainstream media are misplacing the blame on a movie and lying about the true reason behind the Muslim riots. Iowa GOP Chair A.J. Spiker expressed “deep disgust” over the “abortion prayer” prayed by Iowa Democrats last week before the telemed abortion hearings. I’m a lonely, but thankful, mess.